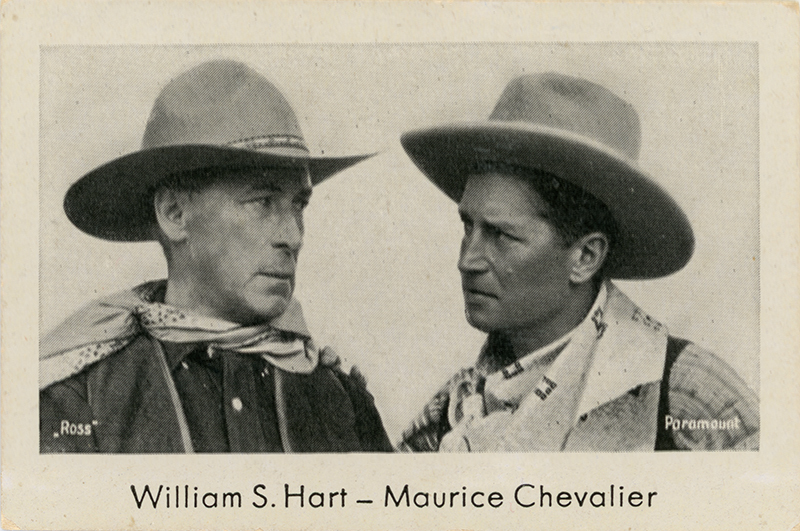 SCVHistory.com LW2938 | William S. Hart & Maurice Chevalier, German Tobacco Card, ~1920s. Tobacco card issued by Ross Verlag, advertising the Paramount stars William S. Hart (1864-1946) and Maurice Chevalier (1888-1972). 1½ x 2¼ inches, for insertion into a pack of cigarettes (like later bubble gum cards). They were collected and usually pasted into an album. Fortunately, this one wasn't. According to RossPostcards.com, Ross Verlag was a postcard publishing company founded in Berlin in 1919 by Heinrich Ross, an Austro-Hungarian Jew (b. Aug. 10, 1870 in Rokytno). Jews were stripped of citizenship in Germany in 1935 and were not allowed to own businesses. By 1937, Heinrich Ross was no longer in control of the business he founded. 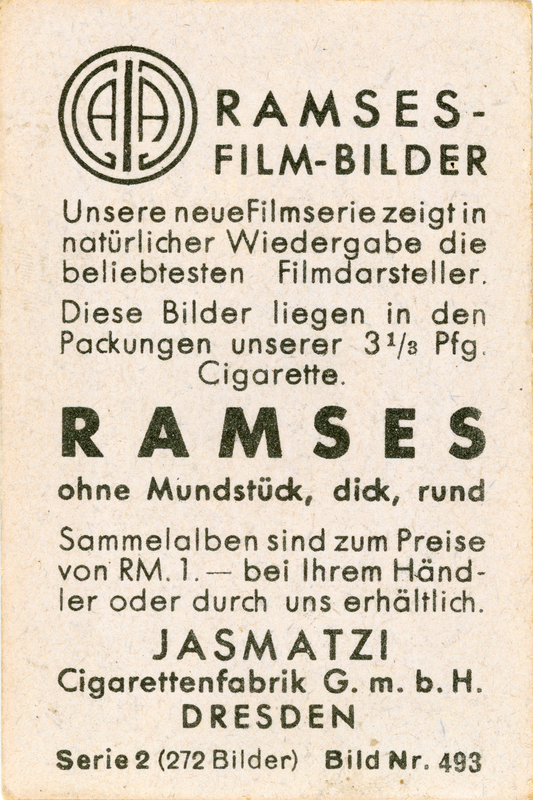 But his brand name was popular; the Nazis kept the business in operation under its original name until 1941 when they changed it to Film Foto Verlag. A widower, Heinrich Ross was one of 937 passengers, most of them German Jews, who sailed out of Hamburg May 13, 1939, bound for Cuba. But Cuba and then the United States refused them entry, so they returned to Europe. They landed in Belgium and were granted refugee status in four countries. Ross and 275 others went to England. (They were the lucky ones; an estimated 254 who went to France, Belgium and the Netherlands died in the Holocaust after those countries were occupied.) Three years later, on Oct. 6, 1942, Ross was allowed passage to the United States. Arriving Oct. 29, he joined his daughter Edith and her husband in New York; then he moved to Chicago where his son Egon was living. The Ross children had fled Germany in 1939-1940 by way of Japan. In 1945, Heinrich Ross, now 75 and devoid of retirement savings, was working in a machine shop and living in a Hyde Park apartment. He reportedly worked until he was 84. In 1956 he received compensation from the German government for the loss of his company. A year later, on Aug. 3, 1957, while hospitalized for pneumonia, he suffered a fatal stroke. Unsere neue Filmserie zeigt in natürlicher Wiedergabe die beliebtesten Filmdarsteller. Diese Bilder liegen in den Packungen unserer 3&frac13; Pfg. Cigarette. Sammelalben sind zum Preise von RM. 1. — bie Ihrem Händler oder durch uns erhältlich. Our new film series shows faithful reproductions of the most popular film stars. 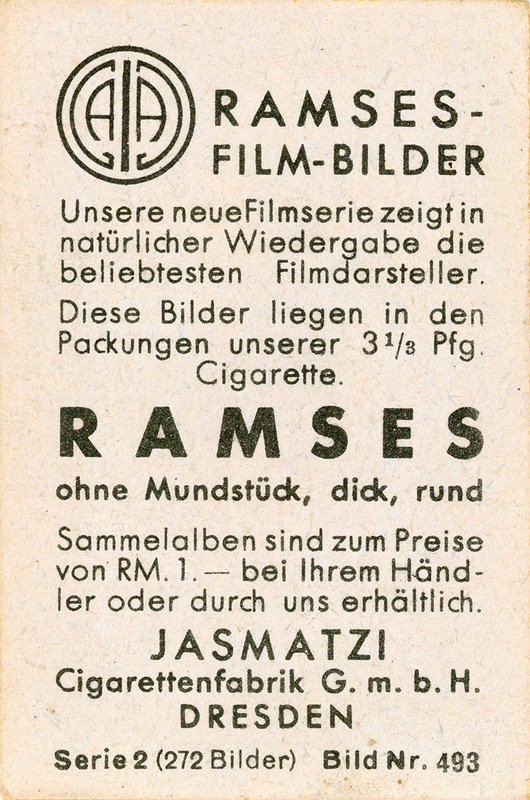 These pictures are inserted into packs of our 3&frac13;-pfennig cigarettes. Collectors' albums can be obtained for 1 Reichsmark from your retailer or though us. LW2938: 9600 dpi jpeg from original tobacco card purchased 2017 by Leon Worden.